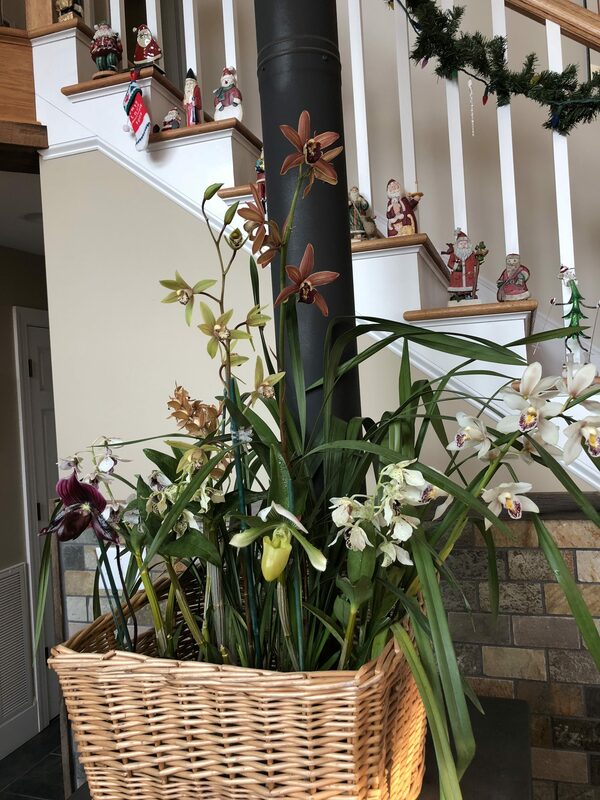 A well-arranged display of orchids can do much to add excitement to the interior of any house and can provide you with a chance to show off your growing skills to your family and friends during holiday gettogethers. Often I have wonderful plants that bloom in the greenhouse, but as often as not, I am the only one who gets to see them. 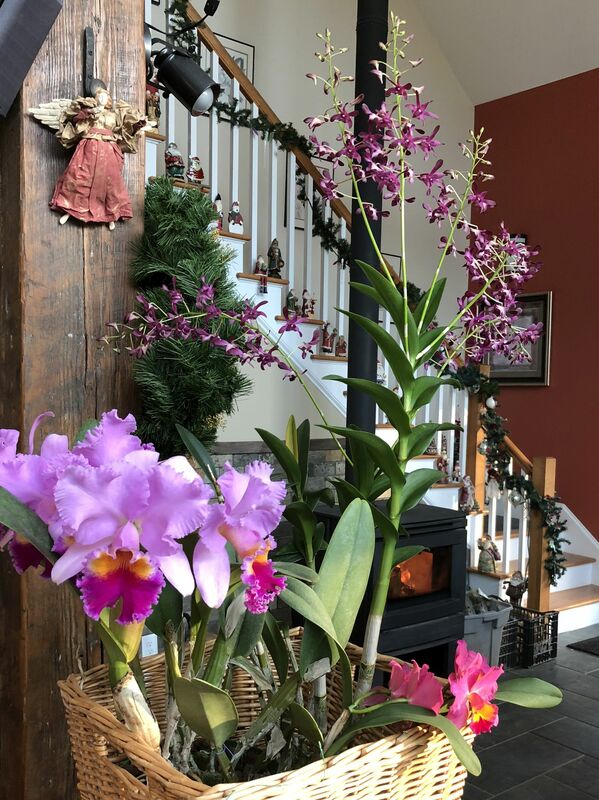 But especially during the holidays when we entertain, I get to share the beauty with my friends by creating orchid arrangements in the house for all those holiday parties! The trick of course is to have plenty of mature plants that bloom during the holiday season. In most cases (an exception would be Phalaenopsis that have been forced to bloom out of season), an orchid plant will bloom the same time each year give or take a week or two, so if you buy a blooming orchid plant at Christmas time, you should reasonably expect that if you treat it right, it will be in bloom around the holidays the next year. The following are images of some arrangements we enjoyed during the holidays this year. The first arrangement contains some warmth tolerant Cymbidiums. When I first began growing orchids in southern California, I loved Cymbidiums. But here in the south where daytime summer temps are in the 90s daily (and nightime temps often stay above 70), standard Cymbidiums are much more difficult to flower. I am growing a few hundred that have been created for these hot conditions and the first to bloom are very nice. 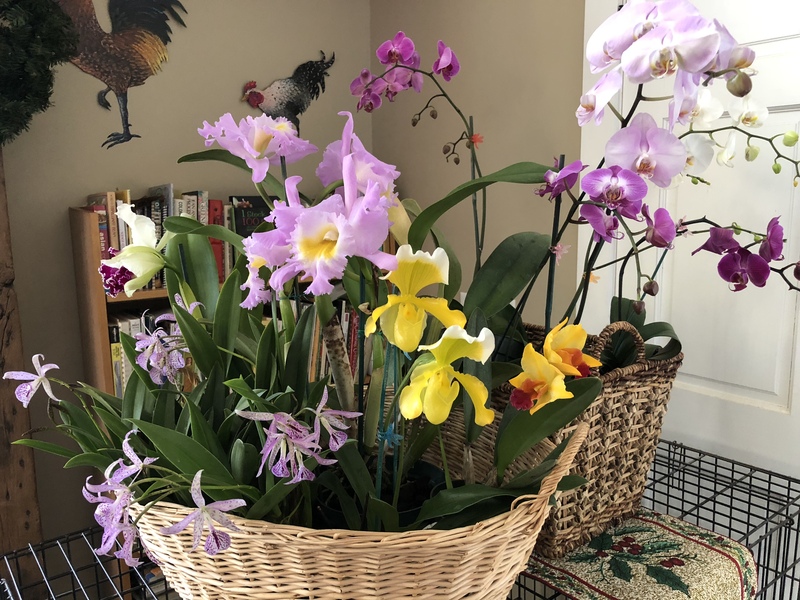 Basket containing Cymbidiums, Paphs, and Dendrobiums. The second is a pair of baskets. The first has some seasonal Cattleyas and a Paph. The second has some early-blooming Phals, all of where are hybrids that I have created myself. Front basket with mostly Cattleyas while the one behind has Phals. The final basket is my favorite and is very simple. 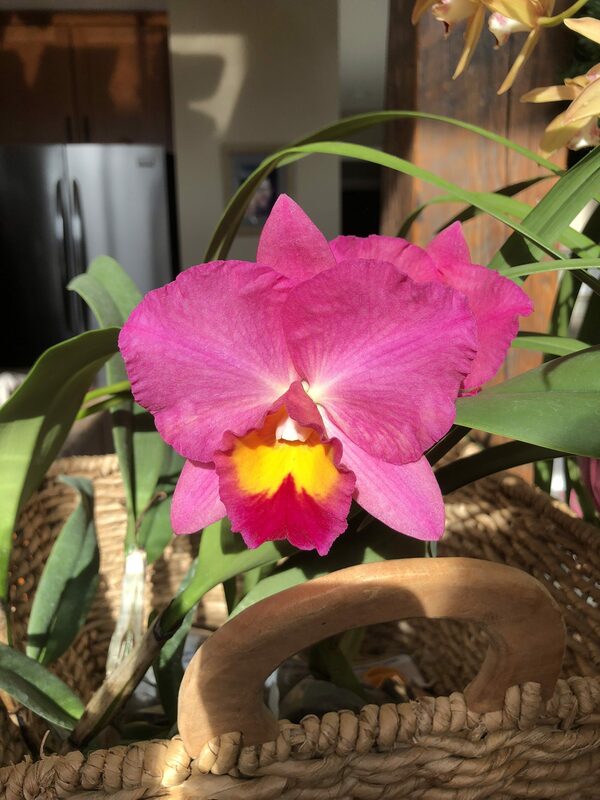 The large Cattleya is Lc Summit View ‘Primero’, my favorite Christmas-blooming orchid. The tall plant is Dendrobium Hawaiian Punch (Den. Norma Jackson x Blue Twinkle), which blooms twice a year with several tall long-lasting spikes. The small Cattleya is kind of lost, but is truly spectacular up close and is shown below. The simplest arrangement of all! Previous Previous post: October means flowers!